I'm not a morning person. The less I have to think about, the better. But skipping breakfast is a no-no. With nothing in my stomach, I'm no bueno. Besides, I need fuel for my morning workout. A friend turned me on to my new favorite breakfast, so I had to share it with you all! It sounds a little weird at first, but trust me, it's so good. It's the perfect combination of sweet, hearty, healthy, and delicious! And it's quick, which is very important for a non-morning person as myself. Measure 1/2 cup of oatmeal and add just enough water or milk to moisten it. Pop it in the microwave for 45 seconds. Remove it and stir in a tablespoon of natural peanut butter, a squirt of agave nectar for sweetness, and a dash of cinnamon. You can then throw in whatever else suits your fancy: dried cranberries, walnuts, strawberries...even chocolate chips! 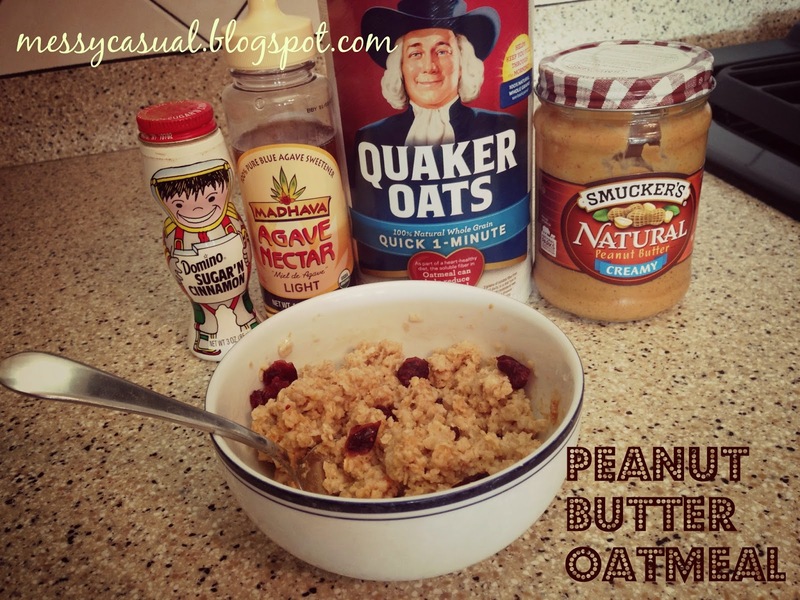 Of course, you can tweak the recipe to your liking with the type of oatmeal you use and how much of each item you add. It's no ultra-healthy kale/carrot/banana smoothie, but for those of us not on the Gweneth Paltrow meal plan, I feel like it's pretty healthy. So if you're headed off to work, the gym, or chasing around kids all morning, this breakfast will keep you going. Enjoy!